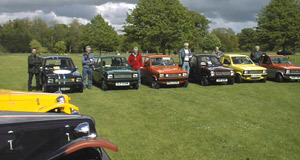 The Reliant Kitten Register, poorly named as it happens, was formed in 1991 to provide a point of contact, not only for owners and enthusiasts of Reliant Kittens, but also all the other under 1 litre 4 wheeled Reliant built or based vehicles. The intentions of the Register are to keep track of as many of these fine little cars as possible, whilst at the same time giving their owners a means of communication. A bi-monthly A5 Magazine is sent to subscribers. The sourcing of difficult spare parts and provision of technical information are prime priorities. There were approximately 2600 Rebels built between 1964 and 1974, about 900 of which were exported. 4,074 Kittens were made from 1975 till 1983, again a number were exported. Both the Rebel and the Kitten were made in small numbers in left hand drive form to suit some of their export markets. Fox production topped the 1,000 mark between 1983 and 1988. In fact the last four Fox chassis produced were made by Bean Engineering after they took Reliant over in 1991. Just 6 Ciphers were produced by Tony Stevens, though another one or possibly two, were assembled from parts. 67 Jimps were built between 1981 and 1983 on the Kitten chassis, and a smaller number of Salamanders at about the same time. Tempest production reached the 20s and is still rising and a number of other specials have been built, including the Vantique and Asquith vans, both by companies and individuals. Peter Davis built 52 of his sporting two-seater Liege between the early 1990s and 2007. The fact that some people have fitted alternative engines to their Rebels and Kittens, ranging from the Talbot Sunbeam (Hillman Imp) unit through Fiat 1600cc twin cam, and Peugeot 1.9 diesel, to a range of V8 devices, gives you some idea of just how strong and adaptable the Reliant chassis is.